The first plant trypanosomatids were discovered in plant tissues over 100 years ago, but we know very little about their biology, life cycle or how they have adapted to life inside plants. Jaskowska et al. (2015) provide a review of Phytomonas parasites and our current state of knowledge in light of the release of the first genomes in this genus. They highlight some recent genome-wide analyses identified several aspartyl proteases, which are known to be secreted by plant pathogenic fungi. But, these proteases were absent from the trypanosomatids that infect animals. Future comparisons between plant and animal trypanosomatids may help elucidate the evolution of cell surfaces for plant-adapted and mammalian-adpated parasites. 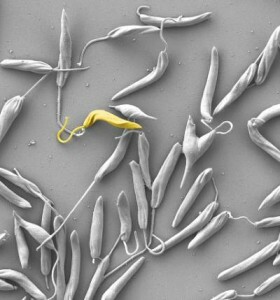 With genomic resources it will be possible to explore the huge morphological diversity exhibited in Phytomonas species. Do morphological differences represent different life cycle stages (i.e., different selection pressures in discrete host environments as found in other trypanosomatids) or something adaptive and important to virulence within plants? spectrum … from crocodiles to coconuts. This entry was posted in adaptation, Coevolution, evolution, genomics, natural history. Bookmark the permalink.